Thor: Heroes Return Omnibus Vol. 1 - Collecting Thor (1998) #1-35, Annual 1999, Annual 2000, Iron Man (1998) #21-22, Juggernaut (1999) #1, Peter Parker, Spider-Man (1999) #2, 11, and Silver Surfer/Thor (1998) #1. I picked this omnibus up last year when it was first released based primarily upon a good recommendation from a friend of mine, but also because Thor has become one of my favorite Marvel characters over the last few years. I was actually in the middle of reading the Thor by Walter Simonson Omnibus when this arrived, and as epic as that was, it was a lot of Thor and I needed a bit of a break. 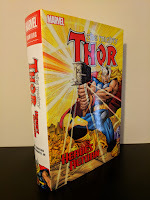 So now, almost a year later, I finally got around to tackling this first volume of Thor from the Heroes Return era. 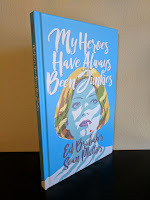 My Heroes Have Always Been Junkies - Collecting the My Heroes Have Always Been Junkies (2018) Original Graphic Novel. Ed Brubaker and Sean Phillips have long been one of the preeminent comic book creative teams. They have been collaborators for nearly twenty years now, and even then My Heroes Have Always Been Junkies signifies a first for the duo: it is their first foray into the use of the original graphic novel (OGN) format. The OGN format may be something new from the creative team's bag of tricks, but it will feel quite familiar to long time fans as it is set within their popular Criminal universe (which they will be returning to after a number of years with a new monthly series in 2019).